Suffering from the summer heat? Take a stroll back in time to see how one would enjoy the Jersey Shore in style. 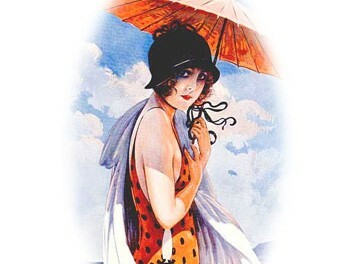 History of the Fashionable Bathing Suit It was in the early 1800s that people began to flock to the beaches for seaside amusement; along with this new outdoor pastime came the need for a stylish garment for the privileged lady of fashion. 1900s Bathing Suits Women typically dressed in black, knee-length, puffed-sleeve wool dresses, often featuring a sailor collar, and worn over bloomers or drawers trimmed with ribbons and bows. 1920s Vintage Swimsuits Women’s 1920s vintage bathing suits came in several contrasting colors. Styles included two-piece swimsuits consisting of jersey shirts and flannel trousers. The Bathing Machine The etiquette of Victorian beaches and swimming. Fun In The Sun! Jersey Shore Resorts During the mid-1800s people began to flock to the Jersey Shore as one of America’s favorite places to play. Fancy Footwear for the Beach The bathing costume was typically accessorized with long black stockings, lace-up bathing slippers, and fancy caps. See the Jersey Shore in 1901 Fun look at “real” people from over a hundred years ago in their turn-of-the-century bathing suits and other summer clothing.